Scientists from ITMO University launches free online course on plasmonics on edX. The course starts on November 1st, 2018. Listeners will learn the latest achievements and modern applications about plasmonics, which were received only in recent years by ITMO. Plasmonics is a newly emerged and fast growing branch of optics. In this course, you will learn about the whole diversity of unique effects appearing at the junction of nanotechnology, subwavelength optics, quantum mechanics, and solid state physics. You will find out how giant field enhancement near metallic nanostructures can be used for detecting single biomolecule, and whether it is possible to build a nanometer scale laser. Within the framework of the course, we will discuss in details the fundamental principles of light interaction with plasma oscillations in solid state. Studying plasmonics on massive open online course (MOOC) is a unique way for students from all over the world to learn this subject from the University, which is one of the innovative institutions in this field. 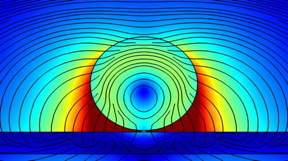 The course is divided into five sections: electromagnetic properties of metals, surface plasmon-polaritons, localized surface plasmon resonances, bulk plasmon-polaritons and applications of plasmonics. The instructors of the course are Andrey Bogdanov, Associate Professor of the Nanophotonics and Metamaterials Department at ITMO University, and Mihail Petrov, Researcher at the Nanophotonics and Metamaterials Department at ITMO University. This course is aimed for graduate and undergraduate students who are majoring in physics and engineering science related to optics. As well as researchers who want to gain or deepen their knowledge in the field of modern photonics. This course can give a boost to your educational or academic career, and potentially will stimulate you to conduct your own research in this field. Andrey Bogdanov tells: «Plasmonics is a newly emerged and fast growing branch of modern optics. Researches in this field are carried out at the ITMO University by the course team. That is why the course demonstrates not only well-known results about plasmonics all over the world, but also those that were received only in recent years by ITMO and Russian researches. Listeners will get the latest information about what plasmonics are and what it is studying. All those who have completed the course will acquire the minimum required set of knowledge for independent research in this area». ITMO University is one of the Russia’s National Research Universities. It is concentrated in information and photonic technologies. ITMO focuses on IT, Photonics, Robotics, Translational Medicine, Art & Science, Urban Studies and Science Communication.